The Peace and Freedom Party supports Mary McIlroy in the 9th State Senate District. For a map of the district, see the bottom of this page. Mary McIlroy is a life-long political activist and socialist, who grew up attending anti-Viet Nam war rallies with her parents. Her father was a union printer, and her mother was a clerical worker. Mary grew up in San Francisco, where she attended public schools, graduating from Mission High in 1977. She then attended City College of San Francisco and San Francisco State University. She became involved in Irish solidarity work during the 1981 hunger strike, and was a founder member of the Irish Republican Socialist Committees, North America. She took part in other struggles during the 1980s, ‘90s, and beyond, including the anti-apartheid movement, a woman’s right to choose, and protesting US intervention in Central America. She attended many demonstrations against the US wars in Afghanistan and Iraq. Mary registered Peace and Freedom in 1987, and was elected to the San Francisco Central Committee in 1988 and 1994. She ran for US Congress in 2009 as the Peace and Freedom candidate in the special election held for California District 10, when Ellen Tauscher resigned to join the State Department. She currently is the Co-chair of the Contra Costa County Central Committee. She is active in Occupy Richmond, and helped organize an Occupy Earth Day Bay Area event held April 20 in Richmond. The rally and march called on Chevron to stop polluting and drop appeals on property tax assessments. Mary is running for the 9th California State Senate District as a write-in against Democrat Loni Hancock. She is running to defend public education, from pre-K through university. She wants a roll-back of fee hikes, and eventually elimination of fees and tuition for California’s community colleges, CSUs and UCs, a rollback of pay increases of administrators while fees are going up, pay and benefits are cut and classes eliminated, and keeping corporations out of public education. Mary wants to keep state parks accessible to all Californians, and will oppose privatization of this resource. “We can do this if we tax the rich and their corporations,” Mary says. She will fight for the working class of District 9 and the state of California. Mary has a favorite quote from Karl Marx, “Philosophers interpret the world, the point, however, is to change it.” Let’s change the world by writing in Mary McIlroy on June 5. 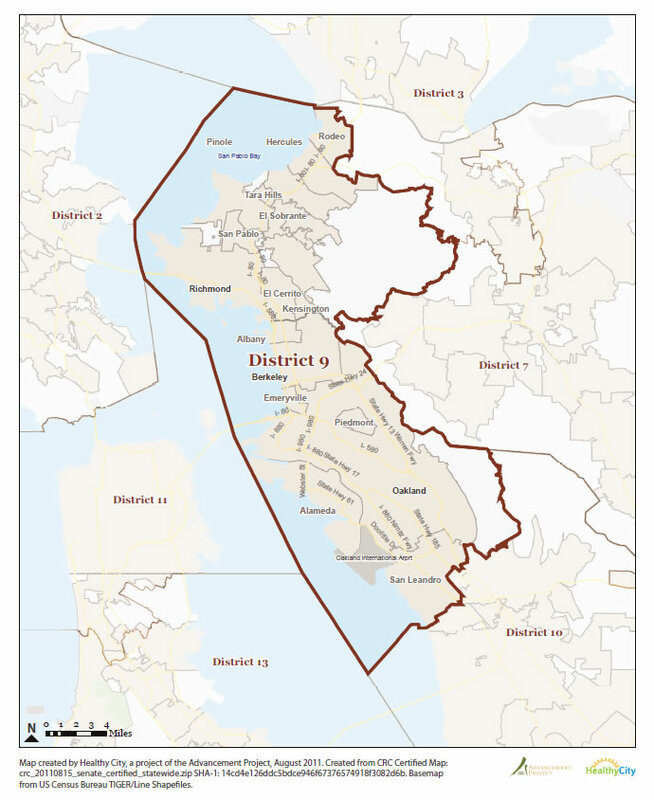 The 9th Senate District includes the coastal portions of western Contra Costa and Alameda Counties from Pinole in the north to San Leandro in the south. For a much better map that you can zoom in, click here. For a larger image of this map, click here.